You must be a member of the São Paulo Outdoor Sports Group to attend this activity. Would you like to join this group? 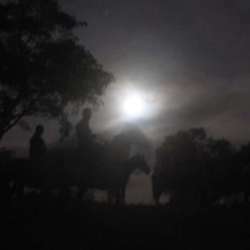 - Full moon horse ride in Fazenda do Rosário, built in Protected content used by bandeirantes during gold and sugar cycles. Everybody can participate, neither horse riding nor trekking skills are required ! 4:00pm : Trekking for 2h30 inside the Fazenda with local guide, through pastures, forests, hills and rocks overlooking the Itú valley. Bring sunscreen, mosquito repellent, shorts and light pants, a good pair of sneakers, water and biscuits or dried fruits. 6:30pm : Transfer by van to Fazenda do Rosário, distant 13 kms. 7:00pm : Free visit, leisure, aperitif with viola caipira band, and dinner in the old restored Fazenda. 11:00pm : Transfer back to São Paulo. Arrival around midnight. SUBSCRIPTIONS only by FULL pre-payment until Wednesday 13th February. Although this is a safe activity, as with every other event, by signing up, you release InterNations and activity organizers from all responsibility in case of injuries, illnesses and disappointments that you might experience during the activity.